A still image taken from a video posted to a social media website on April 4, 2017, shows a civil defense member helping a child in the town of Khan Sheikhoun after what rescue workers described as a suspected gas attack in rebel-held Idlib. Britain, France and the United States strongly condemned Russia Wednesday during an emergency U.N. Security Council for its support of Syrian President Bashar al-Assad and his government’s role in a suspected chemical weapons attack. The attack in the rebel-held town of Khan Sheikhoun, in Idlib province, killed scores of people, including children, and sparked global moral outrage. The World Health Organization said Wednesday the victims appear to show symptoms consistent with exposure to a nerve agent. An umbrella organization of Western relief groups put the death toll at 100, with more than 350 others stricken. 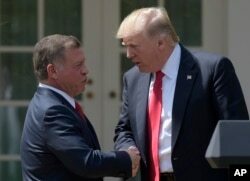 President Donald Trump and Jordan's King Abdullah II shake hands following a news conference in the Rose Garden of the White House in Washington, April 5, 2017. She appeared to warn that if council members do not step up, the United States could act on its own. Nikki Haley, United States' Ambassador United Nations, shows pictures of Syrian victims of chemical attacks as she addresses a meeting of the Security Council on Syria at U.N. headquarters in New York, April 5, 2017. The fate of a draft U.N. resolution condemning the attack written by the United States, Britain and France remains in limbo, as Russia’s envoy said at the emergency session he did think the time was right for such action. Russia has "categorically denied" any role in the attack, blaming the incident on Syrian warplanes striking a warehouse or factory storing chemical weapons possessed by rebel forces. Syria's government repeatedly has denied using chemical weapons against civilians throughout the six-year war. At the Vatican, Pope Francis said he deplored "the unacceptable massacre." Williams, an informal adviser to the Organization for the Prohibition of Chemical Weapons, a United Nations agency, says it is possible that Sarin gas stored in a building and hit by an airstrike using conventional weapons could be released. “That could be one scenario, but it is not the most likely,” he said. “If Sarin was stored there and hit by a missile, it would most likely be consumed in the subsequent fireball, but if any Sarin molecules escaped and weren’t consumed in the explosion, then they would disperse. There are too many variables to take into account and I have no way of knowing from afar,” he added. “I think the most likely cause is that an agent was dropped by regime warplanes,” he said. In a statement Wednesday, Doctors Without Borders, a French humanitarian organization, said the symptoms being displayed by those caught up in the attack are consistent with exposure to chemical substances. The U.S. led coalition fighting the Assad forces urged U.N. officials to "open an immediate investigation" and take the necessary measures to ensure the officials, perpetrators and supporters are held accountable. The reported attack on Khan Sheikhoun to the west of Aleppo and south of the city of Idlib, the provincial capital, is the third claimed chemical weapons attack in just over a week in Syria. Another two attacks blamed on the Syrian government were reported in Hama province, not far from Khan Sheikhoun. Earlier this year, the New York-based Human Rights Watch accused the Syrian government of mounting eight chlorine gas attacks on insurgent-controlled areas during the final weeks of the battle for Aleppo. A joint investigation by the United Nations and international chemical weapons experts blamed the Syrian government for at least three chlorine attacks in 2014 and 2015. Idlib province is one of the last strongholds of anti-Assad rebels and U.N. analysts estimate there are nearly one million displaced Syrians in the province, many from Aleppo. VOA National Security Correspondent Jeff Seldin, White House Correspondent Peter Heinlein and VOA's Jamie Dettmer contributed to this report.